This release must be for the graying old school metalheads out there. Those who were there, back in the day. Oops. Yeah. That would include me. 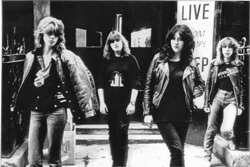 Begun by friends in 1975 Girlschool celebrates 40 years by publishing two live CD, London 1980 and Glasgow 1982, the latter reviewed here. 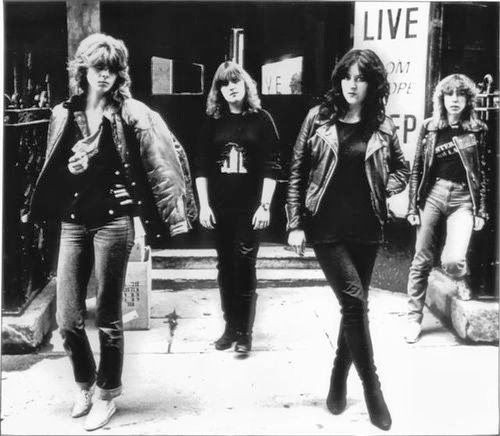 Considered by many as the female side of the New Wave of British Heavy Metal, Girlschool took the stages by storm in the early Eighties. The popularity quickly in both the UK and the United States, touring with the likes of Iron Maiden and Scorpions. The band is still active today and, as I write, are winding up a Stateside tour, then on to Europe. Glasgow 1982 is best described as a vintage recording of the band young and vital. The set list is basically their greatest hits so far, and tunes from the preceding Hit and Run (1981) and Screaming Blue Murder (1982). The recording is surprisingly lucid for the most part, considering the age and technology. However, early in the show the lead guitar doesn't get a proper representation in the mix, improving by the midpoint. Across the entire album, the strongest instruments in the mix are easily the bass and drums. The crowd is also clearly heard, enthusiastic and supportive. The band has plenty of banter with the fans, but you have to listen carefully to catch most of it. Otherwise, Glasgow 1982 is vivid look into early UK hard rock and heavy metal history and the origins of Girlschool. Best picks: The Hunter, Kick It Down, Hit And Run, Live With Me. Glasgow 1982 is vivid look into early UK hard rock and heavy metal history and the origins of Girlschool.